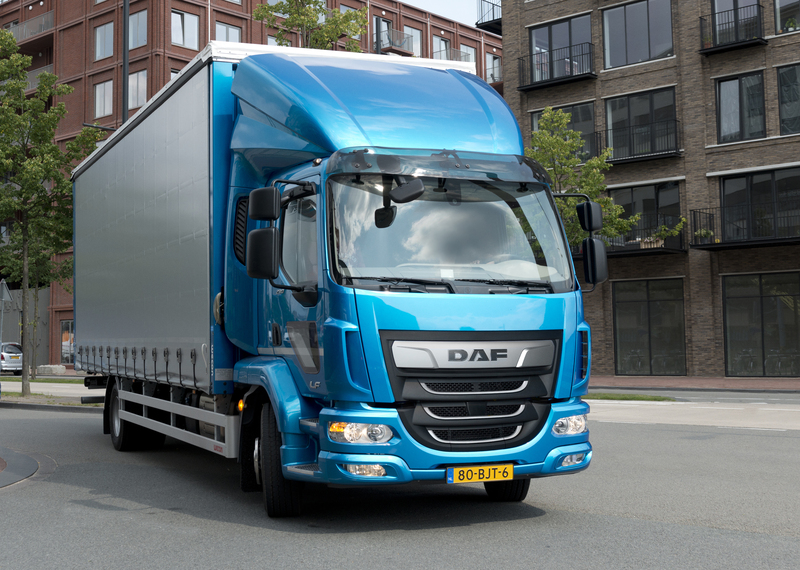 The DAF LF - Pure Excellence - DAF Trucks N.V.
DAF Trucks is introducing a large number of innovations to its New LF series, which will reinforce the truck's industry leading position in the 7.5 to 19-tonne class. The innovations include a new 3.8 litre PACCAR engine and the possibility to select faster drivelines for maximum fuel efficiency. At the same time, the design of the exterior and the interior is aligned with the New CF and XF bringing ‘Pure Excellence’ to the entire DAF range of vehicles. One of the major innovations introduced into the New LF is the new 3.8-litre PACCAR PX-4 engine which is available for the 7.5-tonne version of the New LF in two power ratings: 115 kW/156 hp and 127 kW/172 hp with maximum torque of 500 and 600 Nm respectively between 1,200 and 2,000 rpm. DAF is introducing this new engine specifically for its LF City for light, urban distribution applications, for which an engine with a displacement of just under 4.0 litres is optimal. For higher outputs, the 4.5-litre PACCAR PX-5 (135 kW/184 hp to 157 kW/213 hp) and the 6.7-litre PACCAR PX-7 (172 kW/234 hp to 239 kW/325 hp) engines are available. These engines were enhanced at the end of 2016 with new software and optimised heat and air management. As a result, the maximum torque of both engines is 5 to 12% higher than previously available, and occurs at 100 - 200 lower rpms. The maximum torque of the PX-5 and PX-7 engines is now 850 Nm (at 1,200–1,500 rpm) and 1,200 Nm (at 1,100–1,700 rpm) respectively. The power of the PACCAR PX-7 engine has been increased by 8 kW/11 hp. DAF offers a selection of manual and automated 5, 6, 9 and 12-speed transmissions in the New LF series. In addition, fully automatic gearboxes are available and now the Allison automatic transmission can also be selected on the most powerful versions of the PX-7 to offer performance specifically tailored for vocational applications. The fact that DAF’s New LF can be configured perfectly for any individual use is also attested by the wide range of wheelbases with lengths of up to 6.90 metres. This allows body lengths of more than 9 metres for maximum load capacity. Moreover, the long wheelbase enables fuel tank volumes of up to 1,240 litres. This is a unique LF capability. 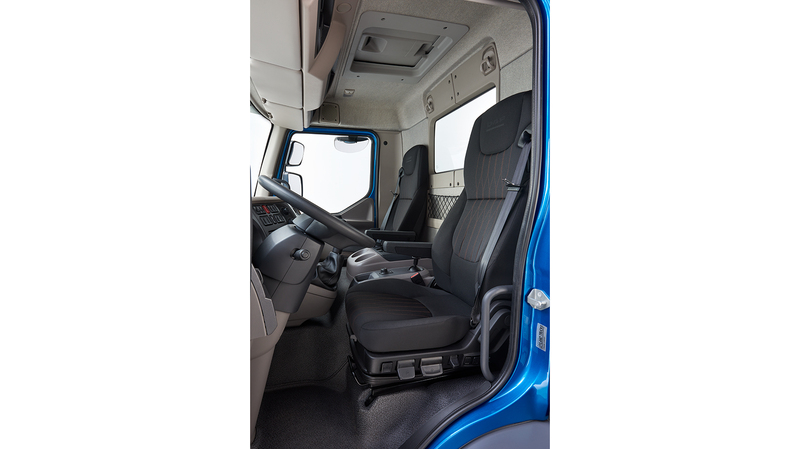 It gives the LF an even longer operating range, optimises vehicle availability and enables the driver to refuel where fuel prices are at their lowest. In alignment with DAF Transport Efficiency, DAF is also introducing innovations to enhance the New LF’s bodybuilder-friendliness. These include the new ‘Body Attachment Modules’, which facilitate the easy attachment of bodywork or equipment. In addition, there are now available specific preparations for the attachment of a box body with tail-lift, a tanker with sub-frame or a tipper. 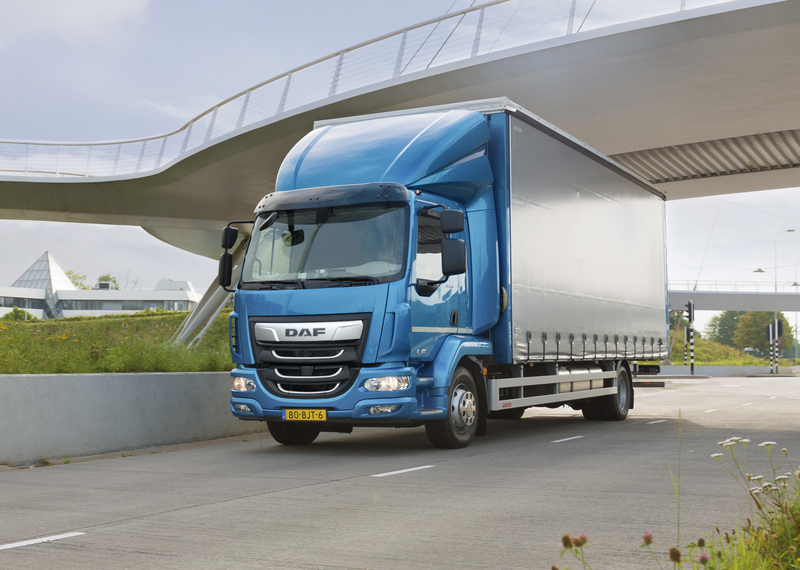 DAF now offers even more wheelbase and rear overhang choices on the LF. The combination of, for example, a longer wheelbase and a shorter overhang makes it simple to mount a refuse collection body. The exterior design of the New LF shares many of the features that give the New CF and XF a completely new look, which is both sturdy and elegant. The attractive chrome strips on the grille and the new logo panel, with the letters 'DAF' with stylish chrome outlines, are particularly striking. Another addition for the New LF is the optional passenger door lower window to optimise passenger side visibility in urban environments. 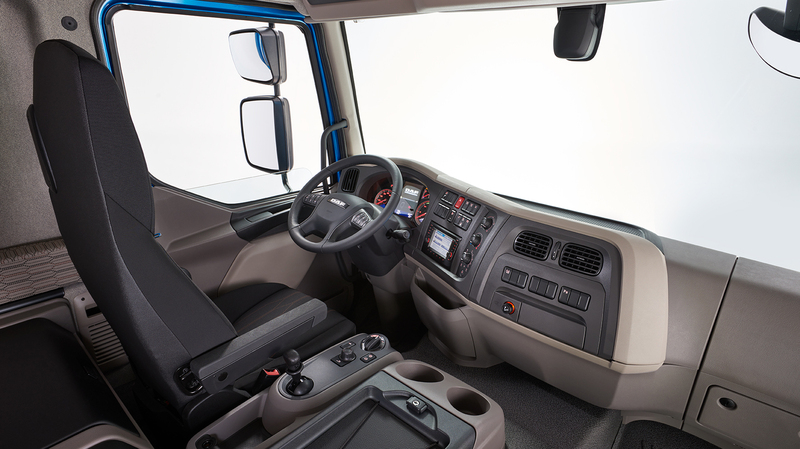 Thanks to the new lower window, the driver can easily see cyclists and pedestrians alongside the cab. The New LF interior features updated, warm and tasteful colours that accent the quality environment designed to make every driver feel at home. The driver information panel (DIP) has been redesigned in the New LF. Changes to graphics make messages clearer and the dials feature a contemporary font style that gives the instruments a fresh look. 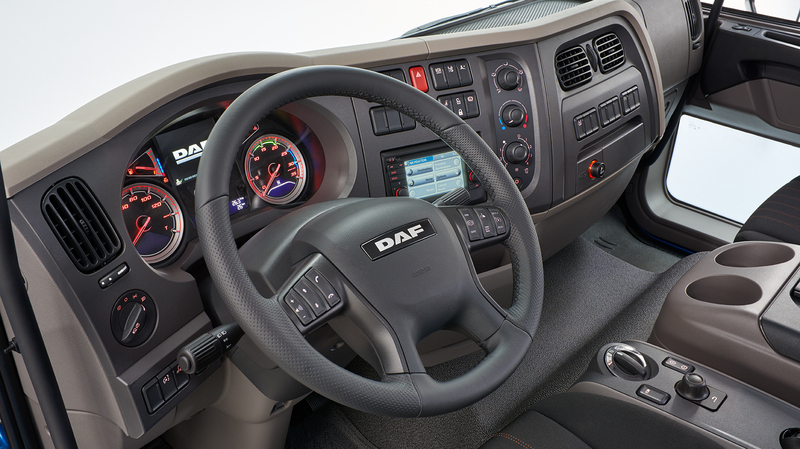 DAF is also offering DAF Connect on the New LF. This innovative fleet management system gives the transport operator real-time insight into the performance of vehicles and drivers. Information about vehicle location, fuel consumption, mileage, vehicle utilisation and engine idling is presented clearly in an online dashboard, which can be customised to suit individual operator requirements. Detailed fuel reports can be easily generated and DAF Connect facilitates comparisons of current and recent data of vehicles and drivers. The ‘Live Fleet’ feature provides the fleet manager a programmable array of useful information about the location of the vehicles, routes and driving time which help to optimise fleet planning and utilisation. DAF Connect optimises vehicle availability, reduces operational costs and increases logistical efficiency. Furthermore, DAF Connect enables the transport operator to better schedule maintenance and repairs by taking advantage of customised advice, generated by DAF Connect. The New LF (from 8 tonnes GVW and with rear air suspension) comes standard with Advanced Emergency Braking System (AEBS), Forward Collision Warning (FCW), Adaptive Cruise Control (ACC) and Lane Departure Warning System (LDWS). Adaptive Cruise Control (ACC) automatically adjusts the speed of the truck to match the speed of the vehicle it is following and, as a result, a safe distance is maintained between the two vehicles. This enables cruise control to be used as much as possible, which provides a fuel economy benefit. Lane Departure Warning (LDWS) works with a camera mounted on the windscreen and if the truck unintentionally strays from its lane, the driver is given an audible warning. Thanks to the many new features and innovations, the DAF LF’s position as the leading distribution truck is further strengthened. Optimisation of the drive line, further enhancements to the chassis for optimum bodybuilder-friendliness, class leading electronics and safety features, and a redesigned exterior and interior enhance the position of the DAF LF as the best choice. 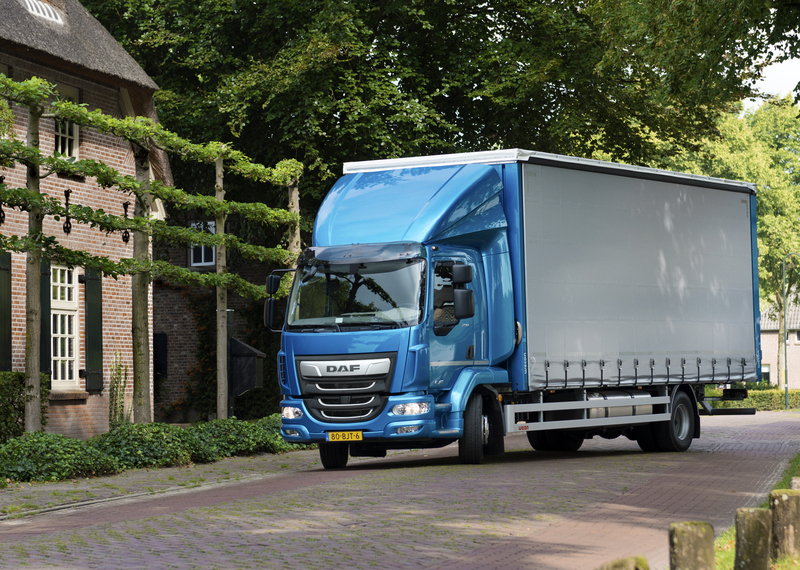 The New DAF LF: Pure Excellence.